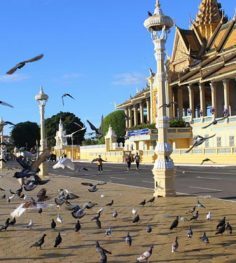 This highlight 4 days visiting Cambodia with Phnom Penh, the Pearl of Cambodia, houses much sensational colonial architecture and iconic landmarks and Siem Reap, the famous temples of Angkor, Angkor Thom, Ta Prohm, Banteay Srei, Banteay Samre, and Pre Rup - all these Khmer-style temples, built between the 10 – 13th centuries, are impressive and certainly not to be missed when in Cambodia. 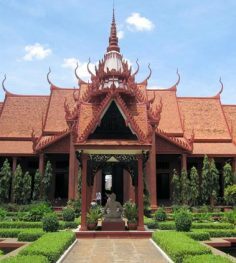 Upon arrival in Phnom Penh, welcomed by our guide and transfer to your hotel for checking in. Breakfast at hotel. Then take short flight from Phnom Penh to Siem Reap. 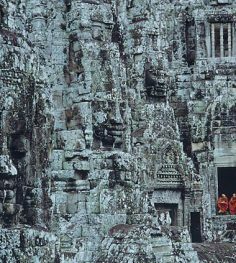 Visit Angkor Thom. The fortified city of Angkor Thom covers an area of 10 square km. Enclosed by a wall and wide moats, the city includes many of Angkor’s most popular sights. Enter by the monumental South Gate over a causeway lined on either side by statues of demons and gods, each carrying a giant naga. Continue to the Terrace of the Elephants and the Terrace of the Leper Kings, former spaces for public cermonies, both adorned with dramatic bas reliefs. Visit the ruined Baphuon, Royal Enclosure and Phimeanakas before continuing to the mysterious Bayon Temple. In this temple, one of the most popular and compelling in Angkor, explore the galleries of beautifully preserved bas reliefs and ascend narrow stairs to reach the central sanctuary, where you will find giant stone faces smiling enigmatically down at you from every angle. Continue to Ta Prohm: one of the most popular attractions of Angkor as much of the jungle has not been cleared and it looks very much as most of the Angkor monuments would have appeared when European explorers first stumbled across them. Watch the sun set over the Cambodian countryside from the upper terraces of an ancient Angkorian temple. Visit Angkor Wat. The crowning jewel of Khmer architecture, Angkor Wat is the national symbol and the highlight of any visit to Cambodia. The largest, best preserved, and most religiously significant of the Angkor temples, Angkor impresses visitors both by its sheer scale and beautifully proportioned layout, as well as the delicate artistry of its carvings. To approach the temple, first cross the vast moat, continuing along a broad causeway lined with naga balustrades. As you enter the main building, ascend through a series of galleries and courtyard before reaching the central sanctuary, which offers beautiful views back over the causeway and across the surrounding countryside. On the way, stop to enjoy the intricate stonecarvings that adorn nearly every surface, with some 1,700 Apsaras, or celestial dancers, sculpted into the walls. Along the outer gallery walls run the longest continuous bas-relief in the world, which narrates stories from Hindu mythology, including the famous Churning of the Ocean of Milk. Angkor Wat is stunning at any time of the day, but sunrise and sunset are especially beautiful times to watch the play of light on the stones. Visit Pre Rup Temple. Pre Rup built by Rajendravarman II (ruled 944 to 968), it consists of a pyramid shaped temple with the upper-most of the three tiers carrying five square shrines arranged as a quincunx. The name means turning the body and refers to the traditional method of cremation. The morning you will enjoy a boat ride on the Tonle Sap lake. This is the largest permanent fresh-water lake in South East Asia and flows into Tonle Sap River, joining the Mekong in Phnom Penh. See a fisherman’s floating village with floating schools, floating police station, etc. It is same as a big village floating on the lake, and the village move from place to place following water levels and current. Transfer to the airport for your flight home. End of services.